That’s pretty much the whole story: Nolan Ryan is writing a cookbook. It is to be called The Nolan Ryan Beef Cookbook, which would be a sweet title for a hip-hop album full of diss tracks targeting Robin Ventura. Ryan’s a rancher, so maybe he also knows good ways to prepare beef. I’m open to it, at least. The guy’s good at stuff and he probably likes meat a lot. 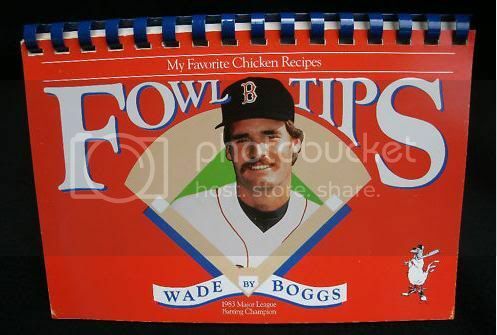 But for my money, the standard-bearer in monocarnivorous baseball cookbooks is still Wade Boggs’ Fowl Tips. Every few months I search the Internet for a copy for sale, but nothing yet. For those wondering, Boggs managed a tiny-sample .974 career OPS against Ryan, so score one for chicken in the long-fought battle for meat supremacy. Also worth nothing: Customers who viewed Fowl Tips on Amazon.com also viewed Rawlings batting doughnuts and Everybody Poops.